Northrook College’s spectacular new Broadwater Campus in Worthing required a specialist galvanised support system and Trocal flashings. Next time you’re in the spectacular new concourse at Blackfriar’s Station, look up. We manufactured and supplied the secondary support steelwork and insulated membrane gutters, polyester powder coated fascias and cappings in March 2010. We supplied the secondary support and screed partitioning flashings for Brighton’s spectacular Amex Community Stadium. On Plymouth’s Life Centre, we supplied the secondary steel support, single skin aluminium powder coated gutters and rainwater pipe system, aluminium fascia, soffit and capping systems and secret fix rainscreen panels. 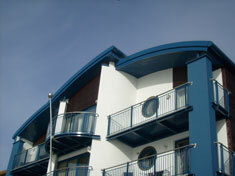 Worthing Yacht Club’s fabulous new headquarters features our curved roof, soffits, fascia and rainwater pipes. We are proud to have been chosen to supply the bullnoses for the new Repatriation Centre at RAF Brize Norton.